It is understood that the kyat will initially be floated at 800 to the US dollar. Reuters news agency reported this week that Central Bank Deputy Governor Maung Maung Win stated in a presentation that preparations for the move would be made “by the end of the month”—the beginning of the next financial year. This would be followed by a gradual “managed floatation” of the currency over the coming year, claimed the report. This would also include 11 private banks being allowed to trade the kyat with US and Singapore dollars and the Euro, thereby seeking to eliminate black market trading in the currency. The Burmese government has long struggled with a limited ability to control the kyat's market value. The rate of the kyat was described as the “mother of all prices” by U Myint in a presentation on last year's dangerous appreciation which made it the best performing currency in Asia, and therefore caused havoc to local exporters. The dual currency rate not only made government control of exchange rates difficult, but has also been labeled as the country's most important mechanism for graft. While accounting is done at the official rate, which has been pegged at roughly six to the dollar for over 30 years, commodities such as natural gas are sold on the international market at the more realistic rate of around 800 to the dollar. This practice results in only 15 billion of over 2,000 billion kyat of gas revenues per year appearing on the books, and therefore being available for regular expenditure. Economist Sean Turnell believes this led Burma to have an “artificial deficit,” as profits were hidden. Analysts assert that much of the hidden money was spent on military capital expenditure—purchasing expensive hardware from international firms. The situation was also blamed on the aforementioned currency appreciation, as beneficiaries of the graft—such as the military-controlled Union of Myanmar Economic Holdings Limited (UMEHL)—used the money to acquire assets in a government “privatization” drive, and flooded cash back into the country, buying kyat. UMEHL was believed to have acquired the largest share of such assets. Turnell, whilst welcoming the floating, questioned whether this step would stamp out the culture of dubious accounting. “It is a good move, and consistent with a more rational way of managing the economy,” he said. “The crucial question that extends from it is whether this rate will now apply to all the foreign exchange earnings of state-owned enterprises. However, the practice is also said to be utilized to supplement the tiny wages of ordinary civil servants. The government recently announced a raise in civil servant wages, perhaps in anticipation of the floatation move which could seriously decrease their income. The government opened official exchange booths in November last year and, as of Feb. 1, allowed undocumented exchanges of kyat up to US $ 10,000. Attempts at reform have been made in the past with limited success—this includes the introduction of the Foreign Exchange Certificate which was used as a surrogate currency but was closer to market rates. The ponderance regarding reform of the currency has also, according to some analysts, been an issue of national pride, with senior military figures viewing a strong kyat as important, even if highly unrealistic. Myanmar Patriots, you guys are really sick and bone head traitors. This is AGAIN one of the tactics of showing we are changing...its totally BS...read carefully what it says...it says a MANAGED float of the currency...what does it really mean...its such a cocky character of the Burmese Gov. And again I say BOYCOTT and Throw out the CRONIES and those who work with them(business associates)the CRONIES are a deadly VIRUS. GET RID OF THE CRONIES and Its BUSINESS ASSOCIATES. Long dead Panglong, with evil tow-faced Clement Attlee. Burma Patriots: suckers by any other name stil suckers! Sucking up to dead Panglong will fill them with vile blood, making them treasonous, ignorant and utterly pathetic. This is a sudden reckless move pushed for multinational companies to come in. What will happen to the people on the street, no one knows. No one cares. Long Live The Panglong Agreement. "As Myanmar has the largest Gold reserves in the world estimated at around 150 000 tonnes the effect could be quite interesting. " REALLY? Where are the 150 000 tonnes of gold? In the ground or on and in SHWEDAGON PAGODA? Fargaung ShuMauing thht about looting the gold from the pagodas; even the English coloniser did not speculate such sacrilege. REMEMBER all problems of Burma are rooted in evil of Panglong and ShuMaung's Burmese Way to Socialism. Learn from Poland; how the Zloty was revalued. Its best they make 1000Kyat per US$ that way we can save lots of energy when calculating exchange rate. Also some poor people might not be able to afford calculator and they could get cheated. I am really not joking. I went to Langkawi in Malaysia a few years ago and hired a car at 50 ringit a day for eight days. The guy I hired it from needed a calculator to work out the cost and even Doyle checked. He looked really surprised when the calculator said 400 which was exactly what I told him. I am sure he thought I had special powers or maybe I was a fortune teller. Let's save trees and reduce greenhouse gases. silver coin.Our passpoarts is no need visa. Every country we can go and we can learn Every country education.so many rich Myanmar. kyats.No visa for our passpoarts and no warranty silver coin for Our corrency kyats. The Burmese government knows very well and has no choice but to float the Kyat as local industries and exporters are on the verge of collapsing and closing due to the weak dollar and overvalued Kyat official rate and will cause wide unemployment in the country. The overvalued Kyat and artifically inflated land prices are not export friendly. The last country abolish such crazy currency system which killed off the prosperity of Burma and made the peoples in power to get rich unreasonably. The world history has already recorded such crazy system of Burma. Myanmar should engage in currency redomination. Many countries have performed redomination. For instance, Taiwan created a new Taiwan dollar equivalent to 40,000 Taiwan dollar back in 1949. Myanmar should create a new kyat equivalent to 1000 old kyats. They can call it anything such as Burmese Dollar. The government should then make a public announcement legalizing the newly re-denominated currency and facilitating the citizens to swap their old notes. Where is the MONEY? Tell the world how much the oil companies have gotten. How the rest goes thru to the accounts of Chinese Banks in Singapore & how it gets there (Thru New York exchange banks ) - making the USA culpable. If Sui Kyi gets into power will the money just then go to the people behind her. 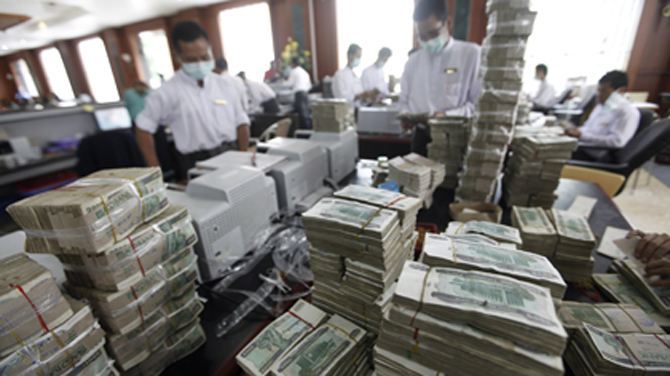 The Kyat is likely to be initially pegged at around 777 Kyat to the US$. The government might also set the price of Gold at an equivalent plus 0.25%. As Myanmar has the largest Gold reserves in the world estimated at around 150 000 tonnes the effect could be quite interesting. Can Burma Re-Open Asean Free Trade Talks with EU?